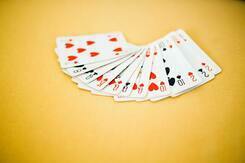 Poker is undeniably one of the most popular table card game today. This game has truly captivated the interests of almost all gamers from both land-based establishments and online gaming sites due to several reasons. Primarily, poker is considered as one of the easiest card game variants in the industry today. Beginner and even regulars can easily understand the gameplay and mechanics of each poker variant - which usually differ on the number of cards played and winning combinations. Players can also learn more tips and techniques from different reviews and guides available nowadays. Texas Hold 'Em is the most played poker variant nowadays. Players start off with two cards or hole cards. These cards serve as the player's game cards until the sessions end. The dealer will then reveal three community cards or the flop which will signify the initial wagering round. Players can either raise the current stake, call the played stake, or fold their cards and end the game. This process continues until the fourth and fifth cards are drawn, or the turn and river cards respectively. The player with the best hand combination wins the total stake at the end of the game or after all five community cards are played. Aside from its usual online gaming sessions, this variant is also used in some of the biggest poker tournaments worldwide such as the World Series of Poker and World Poker Tour. On the other hand, Omaha is a Texas Hold 'Em variant which can be participated on by 2 to 10 players per game. Unlike the original version, dealers in this poker game type deal four starting cards to the players which will all be played as their hole cards. Five community cards are also immediately dealt after the initial round. Players can only use two of their hole cards to make the best five-card hand combination they can get from the community cards. #/p#p This may not be beginner friendly, but Omaha can win players with huge stakes if they have played their gameplays well. In 5 Card Stud, players are dealt with one faced-down and one face-up cards. This allows all players on the table to see the face-up card and gauge whether they'll continue the game. After all player cards are dealt, the community will then be played and the usually raise, call, and fold process continues. Another prevalent feature of this variant is that the player with the highest visible card will start the wagering process. This will only change after the next card is drawn. 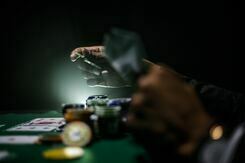 #/p#h Caribbean Stud #/h#p Meanwhile, Caribbean Stud is a slightly different poker variant because instead of going up against other players, a player competes with the dealer at the table. Each round starts with the initial wager placed on the table. The dealer will then hand out five cards to the players and for himself. The player can see all his or her dealt cards and one in the dealer's side. They can then either raise the played stake, call the current wager placed, or fold their active hands. After this process, all cards will be shown with the best player hand winning the stake. Players can also increase their chances of winning big in this poker variant's progressive jackpot sessions. Other poker variants available in the industry today include Seven-Card Stud, Razz, 2-7 Triple Draw, Five-Card Draw, Chinese Poker, HORSE, and many more. Players just need to learn more of their gameplay and mechanics to maximize their played stakes on these game variants.